Thessalonike was the daughter of king Philip II of Macedon, also father of Alexander The Great, and his Thessalian concubine, Nicesipolis. We don’t know her exact date of birth but most historians seem to believe that she was born in 342 BCE. 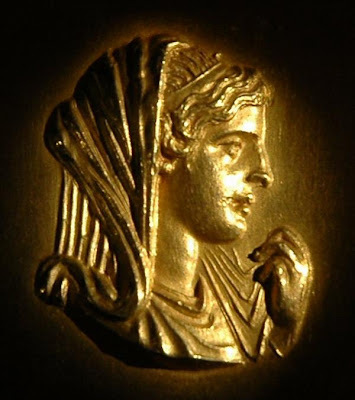 Her name is made up of two Greek words, Thessaly and nike, which means “Thessalian Victory” and she was said to be thus called because, on the day of her birth, her father had won a significant battle against the Phoceans in Thessaly. When he received the news of his child’s birth, he is said to have exclaimed “Let her be called victory in Thessaly!”. Nicesipolis died shortly after her daughter’s birth and so Thessalonike was raised by her stepmother Olympias. It seems that Olympias really did care for the poor child and taught her the ways of Dionysus. However, Thessalonike wouldn’t spend much time with Olympia’s son Alexander as the boy was under the tutelage of Aristotle when she was born and then he went to conquer the world. Upon Alexander’s sudden death, his successor fought for power and a war ensued. Olympia took refuge with Thessalonike in the fortress of Pydna. Cassander, who had grabbed Alexander’s throne, besieged the castle, promising to spare Olympia’s life if she surrendered, but didn’t keep his promise. Next, Cassander married Thessalonike to make his position more secure and give some kind of legitimacy to his reign. It seems that Cassander always treated his wife with respect and even named a city after her. The couple had three children, Philip, Antipater and Alexander. In 297BCE Cassender died of dropsy and was succeeded by his elder son Philip. But a mysterious illness cut both his life and his reign short. Antipater was next in line to the throne but Thessalonike wanted him to share power with Alexander, her youngest son, under her own regency. But Antipater wouldn’t stand for that and, in 295BCE, had his own mother killed.